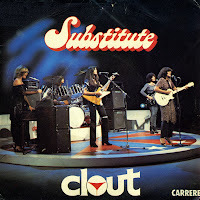 Clout formed in 1977 in South Africa. Original members were Glenda Hyam, Lee Tomlinson, Ingrid Herbst, Cindy Alter and Jenni Garson. Their first hit was 'Substitute', a cover version of a song originally recorded by the Righteous Brothers in 1975.